The positive impact of art in the workplace is often underestimated. Whether you want to provide a talking point in an otherwise bland corporate reception, impress clients, motivate employees or simply fill white walls how do you go about choosing the right art? They say a picture is worth a thousand words, is your office art saying the right thing? When choosing office art there are many things to consider. Here we look at buying and hanging tips for office art. The JP Morgan offices display artwork from every country they operate in, demonstrating global reach whereas LinkedIn uses local artists to convey the message that they support and embrace their local community. BP displays photos of the company’s history promoting a feeling of nostalgia and emphasising longevity and security. What do you want your office art to say about your company? Carefully selected pieces of art can send a clear, yet subtle, message to those who see it, reinforcing the brand values. Art is a good way to start people talking and can give a powerful first impression. Many companies rely on specific types of people or socioeconomic groups for most of their business. Your artwork can help you connect with those groups on an emotional level. 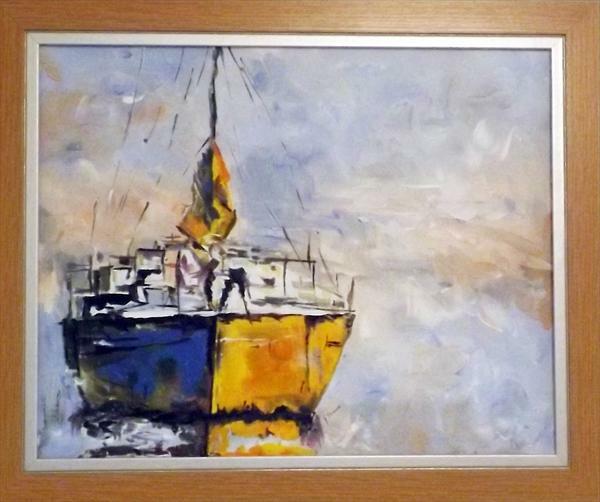 For example, if you are in the financial services industry you may want to display art that reflects the rewards and life style of clever financial planning, perhaps a luxury yacht like the one in Moored for the Evening by Graham Williams, whereas a lawyer specialising in family law may display paintings or photographs of happy families. Office art affects the atmosphere of a room. Research by the British Council for Offices in 2013 suggested that 61% workers believe artwork inspires them to think and work more creatively. Employees thrive in a positive and optimistic environment and it appears that the positive effects of art work on employee productivity, satisfaction and morale cannot be ignored. The use of colour can have a huge impact on the feeling and atmosphere of your office. Different colours evoke different feelings so it’s important to decide how you want your customers and employees to feel. If you want to promote feelings of peace or content, why not use romantic artwork with scenes of nature? Sam Martin’s colour block landscapes are a beautiful example of this. Exciting and fun artwork stimulates creativity and helps to foster motivation. Vibrant colours and pop art could reflect youth and enthusiasm for creative industries such as advertising and design work. Vivid colours evoke energy and spontaneity so could be used in, for example, a call centre where you need your employees to feel energetic and upbeat. Mike Coffey’s playful paintings of London landmarks would add a colourful contemporary twist to the feel of the workplace. Research by Exeter University’s School of Psychology found that employees who have control over the design and layout of their workspace are not only happier and healthier, they’re also up to 32% more productive. Finally, does office art need to be expensive?